The humanitarian situation in Somalia is among the world’s most enduring current crises. As a result of conflict and a very weak central state, the country ran for two decades on an informal economy and localized authority. Though still ranked on the Fragile States Index, government capacity in Somalia has been steadily rebuilt since 2013. In the 2000s, the Food Security and Nutrition Analysis Unit (FSNAU) developed the Integrated Food Security Phase Classification (IPC) in Somalia. This is a standardized scale for decision-making using several types of data that provides the foundation for technical consensus and a common language to classify food insecurity crises. 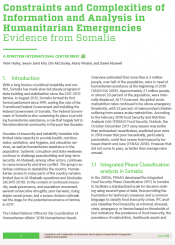 Since its inception in Somalia, IPC analysis has made significant gains in its focus, its rigor, and its ability to accurately portray the severity of the crisis. However, in the changing context of Somalia, several challenges and constraints remain. This brief discusses these challenges and provides recommendations related to the governance of the process and the technical quality of the data and analysis. This report was jointly written by researchers from the Feinstein International Center and the Centre for Humanitarian Change in Nairobi. This is the brief of the full report.